Kirsten Eve Beachy, ed. Herald Press, 2010, 224 pages. 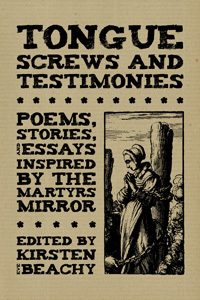 Tongue Screws and Testimonies, a book of essays, poems and artwork reflecting on the Martyrs Mirror, is written by insiders for insiders. In the introductory essay, Kirsten Beachy, the editor, states that this volume reflects a wide variety of opinions and attitudes to the role that the Martyrs Mirror has played and is playing the Anabaptist community. The Mirror was written in the 17th century and many Mennonites have read it alongside the Bible. The book’s eight sections highlight different themes in the Mirror, although it seems that the submissions could have gone in any of the sections. At the beginning of each section, Ian Huebert, an artist, has taken the famous Dirk Willems etching from the Martyrs Mirror, and added some elements. I found the artwork funny and provocative, although slightly out of place because there is little other humour in the book. For me, two of the most provocative essays are those by Julia Spicher Kasdorf and Stephanie Krehbiel. Kasdorf chronicles a story of personal abuse and the community's reaction to it while Krehbiel writes about her coming to the martyr stories later in life. Both writers see themselves as on the edge of the Mennonite/Anabaptist world, but I experience their essays as very much from the inside. Two of the poems that I appreciated most were in tension with each other. In contrast to Kasdorf's poem "Mennonites," is “A New Mennonite Responds to Julia Kasdorf,” written by David Wright reflecting an outsider's view. There is much to ponder about being Mennonite in both poems. Are you on the inside or outside? How can I use this volume in my work in the church as a pastor? In Beachy's introduction, she sets a framework for reading the Martyrs Mirror. It seems to me that this framework could also be used in reading the Bible and I will use it in my Bible study group. This volume can be read as a devotional book, like the Psalms, and I will go back to it often. 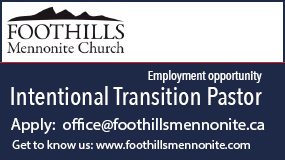 Who am I in our Mennonite world, inside or outside?